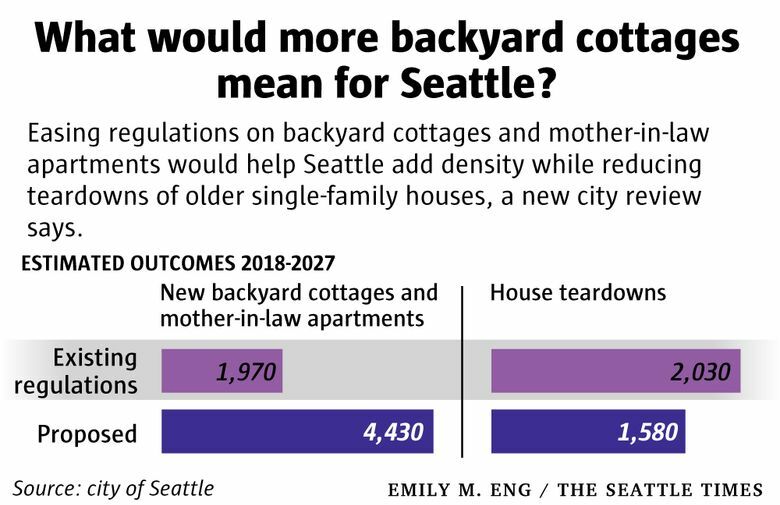 A new review by the city says easing restrictions on mother-in-law units and backyard cottages, as well as restricting the size of newly built houses, would improve Seattle’s housing situation. Easing regulations on backyard cottages and mother-in-law apartments would make Seattle more affordable and reduce teardowns of older houses, particularly if the city also tightened restrictions on the size of new houses, says a new review that could lead to action by the City Council. Due out Thursday, the review by the city says allowing more and larger accessory-dwelling units would help Seattle become denser without any major impacts to parking, traffic, utilities and neighborhood aesthetics. Under the review’s top-choice proposal, which Councilmember Mike O’Brien wants to introduce as legislation, the city would allow two accessory units on a lot rather than one, would no longer require off-street parking for accessory units and would no longer require owners of properties with accessory units to live on site. 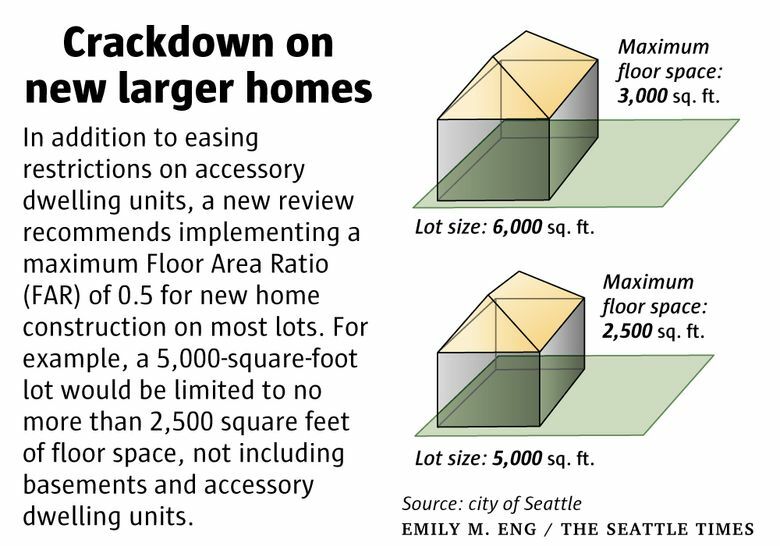 Also under O’Brien’s proposal, Seattle would move aggressively to limit the size of new single-family houses on properties with or without accessory units. For example, on lots covering up to 6,000 square feet, the city would allow no more than 3,000 square feet of aboveground construction, excluding space devoted to mother-in-law apartments. Today, 9 percent of lots of at least 5,000 square feet have houses that would be considered too large, according to the city’s review. “The main reason to do this is to encourage people, instead of tearing down houses to build McMansions, to keep those houses, do remodels and add accessory units,” O’Brien said. Were the city to adopt the proposal, it would add about 2,500 more accessory units over the next decade and see about 500 fewer houses torn down, according to the review, which may draw a legal challenge. The estimates are important because opponents have argued the loosened regulations would contribute to gentrification by encouraging developers to raze older houses and replace them with costly rental properties. The Queen Anne Community Council’s Marty Kaplan, who’s battled O’Brien over the changes, said an appeal is likely. That would stall the legislation for months. “I want to read it, but it sounds like the city didn’t consider anything other than where they wanted to go initially,” Kaplan said. Technically called an environmental-impact statement, the review is the latest step on a long, bumpy road toward passing legislation that would juice the construction of backyard cottages and mother-in-law apartments. Mayor Jenny Durkan and 2017 rival Cary Moon both touted accessory units as a gentle way to add density, indicating broad support. But the idea has been slowed by opposition and process. Backyard cottages are stand-alone structures, while mother-in-law apartments are built inside houses. Between 1900 and 1950, both kinds of accessory units were allowed in Seattle on lots with single-family houses. Then new units were banned. Starting in 1994, mother-in-law apartments could again be built, and starting in 2010, backyard cottages could again be added on larger lots across the city. Still, not many accessory units were constructed, with the city permitting an average of about 45 backyard cottages per year between 2010 and 2014. In 2015, O’Brien began pushing to ease regulations on the units, and a bare-bones city review determined the proposed changes would have no significant negative impact on the environment. But the Queen Anne Community Council launched a legal challenge in 2016, arguing Seattle hadn’t adequately studied whether the changes could contribute to gentrification by encouraging developers to buy modest houses, tear them down and replace them with rental complexes. Kaplan’s group predicted the phenomenon would result in disadvantaged people being displaced. The city lost the case and was ordered to conduct a more thorough review by completing an environmental-impact statement. Now that work is done, and the review says the new regulations would actually help combat gentrification over time, rather than contribute to it. By making it easier to build accessory units, Seattle would help owners increase the value of their properties without demolishing their older houses, the review says. At the same time, by restricting the size of new houses, the city would make it less lucrative for owners to tear down their older houses and replace them with larger houses. Under Seattle’s existing regulations, the city would see 1,970 accessory units built and 2,020 houses torn down by 2027, according to the review. Under the top-choice proposal, there would be 4,430 units built and 1,580 houses razed. In addition to allowing two accessory units and removing the city’s parking and owner-occupancy requirements, O’Brien’s proposal would allow backyard cottages and mother-in-law apartments to take up 1,000 square feet, excluding garage space. At the moment, cottages are limited to 800 square feet, including garage space. The proposal also would allow backyard cottages on lots as small as 3,200 square feet, down from 4,000 square feet, and would allow up to 12 unrelated people on a lot with a cottage and a mother-in-law, as opposed to eight unrelated people. The changes would be welcomed by Andy Fessel and his wife, who recently moved to Seattle from California and bought a house on Queen Anne. They plan to renovate the home for their daughter and her husband and to build a cottage in the backyard for themselves. The younger couple couldn’t afford to buy in the city on their own. 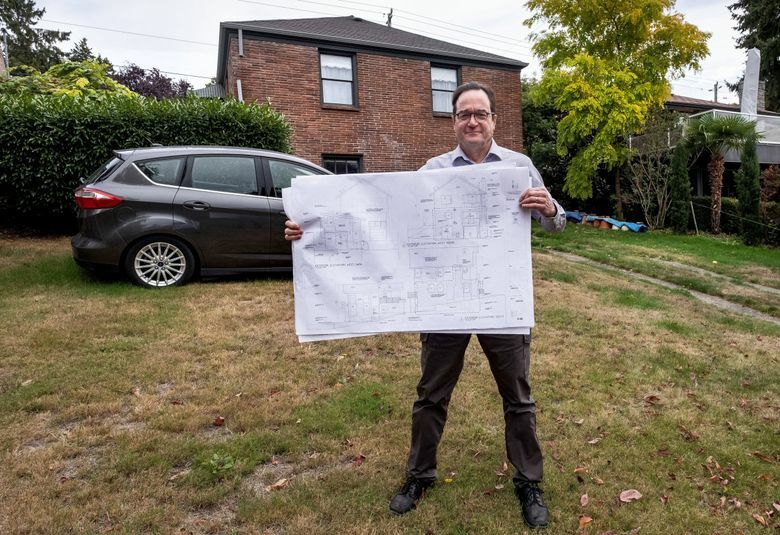 “I’ve had to tell clients that their lots are too small” to add cottages, he said. But the architect wants to know more about the provision that would limit the size of new houses, which wasn’t part of O’Brien’s proposal back in 2016. The restriction could create headaches for certain clients, he said. Foes have expressed skepticism about the city saying the changes would result in no major repercussions for conditions such as parking. “You need to prove to people you think there are no impacts,” Kaplan said. 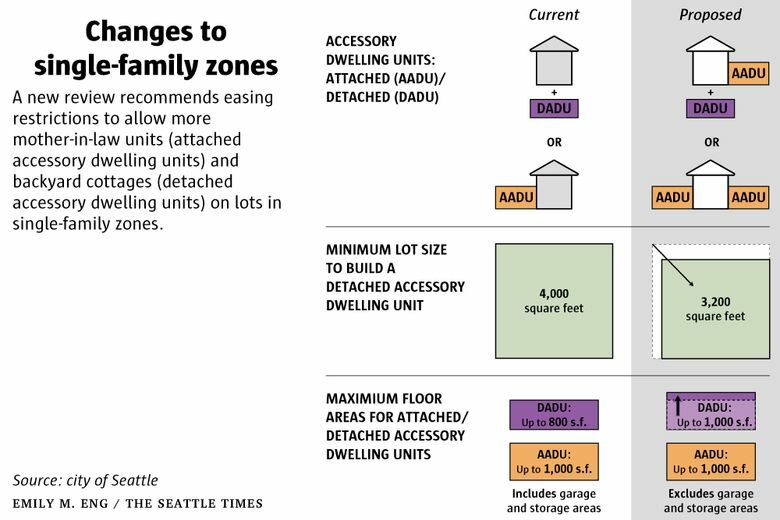 Correction: An earlier version of this story, including a graphic, misstated the proposed changes to the maximum square footage allowed in accessory dwelling units.